OCOSBE Blog • Comments Off on What Now? No matter what your political leanings are, after the election November 8, 2016, many are asking “What now?” What can we really expect from the new administration? How will this change impact my life? What a new presidency (no matter what party) provides is a new opportunity, a fresh start, an open door, a new beginning. To face these new opportunities we need an anchor so that the swelling sea does not overwhelm us. In changing times we need an anchor for the soul. Another Anchor for a soul is a personal trust in Jesus Christ. Jesus said, “You believe in God, believe also in Me.” He said, “Now trust in Me.” He became human, God in the flesh, to save us from our sins. He had a unique birth. Mary was His human mother and God was His Father. An angel of the Lord said, “She shall bring forth a son, you shall call His name Jesus, for He will save His people from their sins” (Matthew 1:21). And He had a sinless character for the Bible says that He “committed no sin” (1 Peter 2:22). Jesus had a very unique ministry. He performed many miracles. He turned water into wine. He healed those who were sick. He made the lame to walk. He made the blind to see. He died a unique death on the cross. He was tried by the Sanhedrin, whipped by Pilate, mocked by the scribes and chief priests and suffered a physical death. Paul says, “For He made him who knew no sin to be sin for us, that we might become the righteousness of God in Him” (1 Corinthians 5:21). They took His body and put Him in a grave, but the grave could not hold Him. The angel said, “Do not be afraid, for I know that you seek Jesus who was crucified. He is not here; for He is risen, as He said. Come, see the place where the Lord lay” (Matthew 28:6-7). I can take you to the graves where my grandparents, father and mother are buried. However I cannot take you to where He is buried. During the French Revolution, somebody said to Bishop Talleyrand: “The Christian religion–what is it? It would be easy to start a religion like that.” “Oh, yes,” Talleyrand replied. “One would only have to be crucified and rise again the third day.” A personal trust in Jesus Christ is a safe anchor for the soul. Another anchor of the soul Is the presence of The Holy Spirit. The work of the Holy Spirit is to teach us God’s Word. John says, “However, when He, the Spirit of truth, has come, He will guide you into all truth; for He will not speak on His own authority, but whatever He hears he will speak; and He will tell you things to come.” The Holy Spirit helps us understand God’s Word so we will know how we are to live our lives. He is our Comforter for Jesus said, “I will not leave you orphans, I will come to you” (John 14:18. He comforts in time of sorrow for He is our “Helper, who will abide with us forever” (John 14:16). The Holy Spirit convicts us of our sin. “When He has come, He will convict the world of sin…because they do not believe in Me” (John 14:8-9). He helps us realize our need of trusting Jesus Christ. The Holy Spirit is present in our lives when we trust Christ. The Bible says, “Now if anyone does not have the Spirit of Christ, he is not His…For as many as are led by the Spirit of God, they are the sons of God” (Romans 8:9, 14). Another safe anchor for the soul Is to have the promised assurance of Heaven. Jesus said, “I will call you home at the end of the journey.” Remember Jesus said, “I go to prepare a place for you.” This teaches us that heaven is a real place. Heaven is the fulfillment of all our spiritual hopes. We have desired to understand more about God and heaven will be the fulfillment of this hope. Heaven is a deep and abiding fellowship with God. Augustine, a Christian, said, “Our souls are restless until they find rest in Thee.” In heaven we will find our true rest in Him. Heaven is homecoming. We read in Revelation 21:3-4, “Behold, the tabernacle of God is with men, and He will dwell with, and they shall be His people, and God Himself will be with them and be their God. And God shall wipe away every tear from their eyes; there shall be no more death, nor sorrow, nor crying; and there shall be no more pain.” This does not mean that little selfish family reunions will be held continuously, but that these earthly ties of love and friendship will be deepened and strengthened in the family of God. The greatest assurance is that heaven is where Jesus is. We will have fellowship with Him who died for us throughout all eternity. 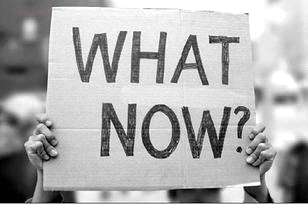 » OCOSBE Blog » What Now?